The Brooklyn Downtown Star just did a whole story on Kai and the Lagoon! Art and Science Lab: “[The] event perfectly blended art and science in a way that was fun, seductive, and educational… From the troupe of bellydancers lounging and freestyling in the “lagoon,” to the skin-baring burlesque performers, to the aerialist acrobats writhing around long pieces of silk dangling from the ceiling—this night bubbled with a sensuality that is seriously lacking in other events dedicated to the sciences, and was therefore able to reach an audience that might not normally be exposed to environmental ideas (regular young adults who like to attend cultural events, but who may not know much about science). 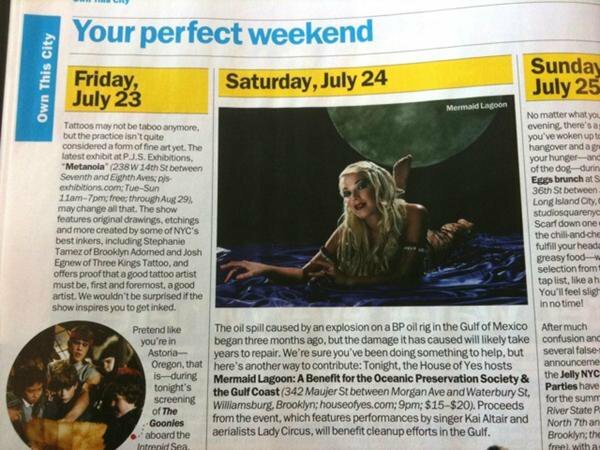 Auxiliary Magazine: “The conceit of the evening was that the ocean home of these mermaids had been gravely threatened by the BP oil spill and they want it fixed… All this was well-executed, well-planned, and interspersed with a DJ and dance floor. In terms of value, a science lecture, a dance performance, a dance club, and a concert in one night was more than worth it.